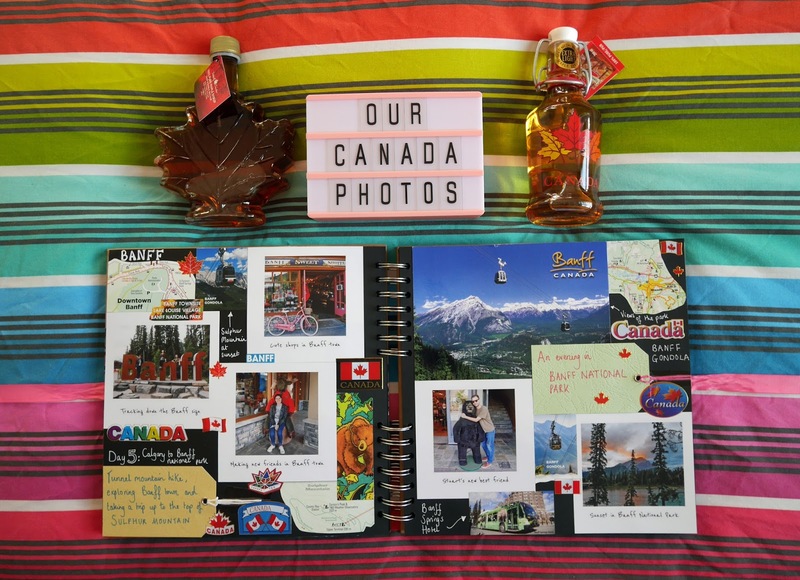 When I have free time at home in the UK, I like to work on my travel scrapbook. 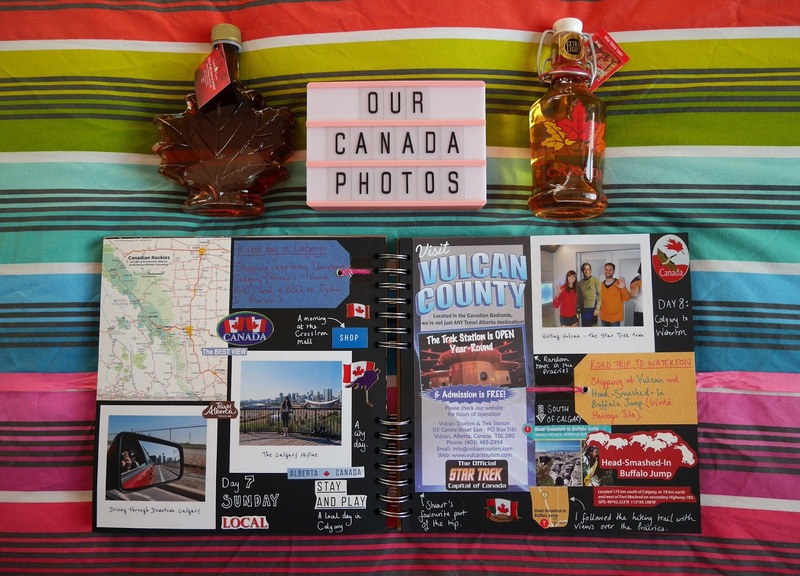 Combining two of my favourite hobbies: travelling and art, scrapbooking allows me to create memorable keepsakes of our adventures that I can look back on in the future. 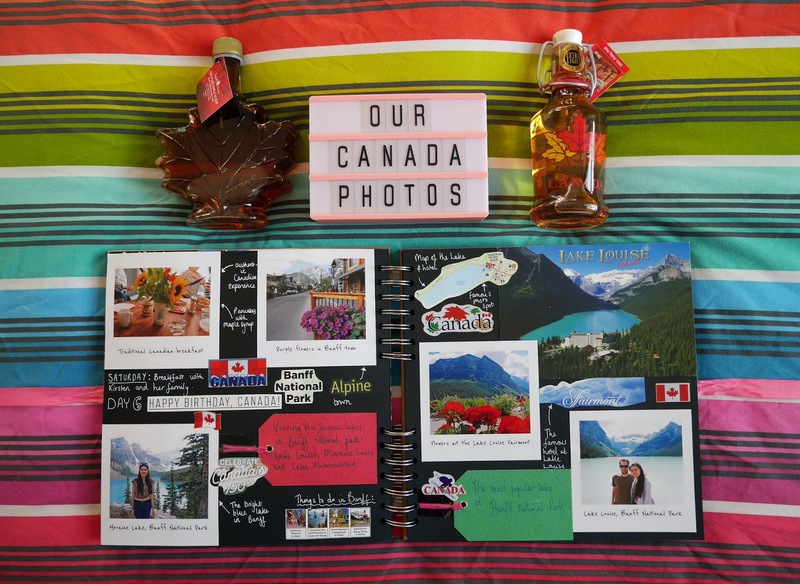 A little while ago I wrote a post about my top tips for creating a travel scrapbook and since I featured my 2016 book in that post, I thought it was about time I show you some up-to-date pictures of my new scrapbook for this year. 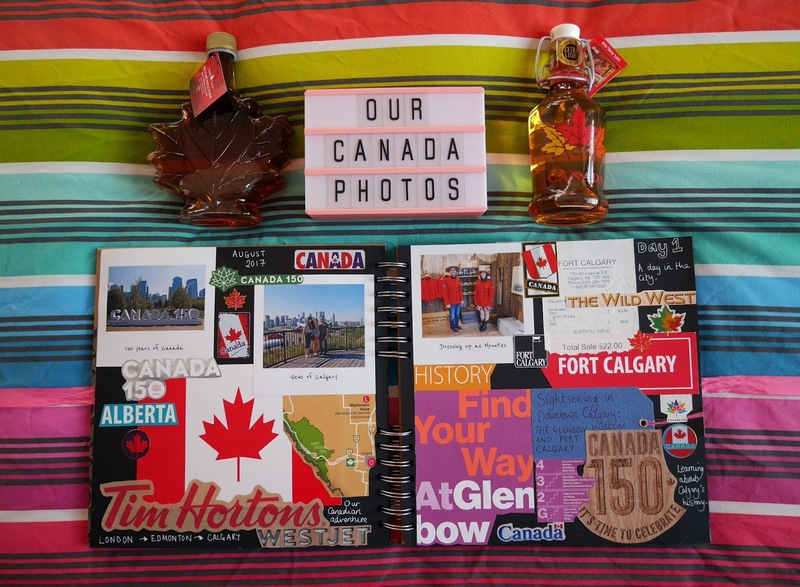 In this post I'm collaborating with the folks at Printiki, who kindly printed some of my Canada photos for me, and I'll be showing you how I've presented my tickets, photos, leaflets and maps in the book from our 10 day visit to Alberta. Printiki offer polaroid-inspired prints (retro prints) which you can even add your own captions to. I was sent 30 of the Retro Square M prints (10cm x 10cm) and they arrived a couple of days after I ordered them. Since they were arriving from Amsterdam, I was really impressed by the speed of the shipping! When I scrapbook, I like to document my adventures in chronological order, so the first thing I did once the prints arrived was start sorting them out into the specific days that they were taken. I put a couple of the prints aside for the title page of this section of my book: the Calgary Canada 150 sign and a group photo in front of the Calgary skyline, before getting to work on the pages. I'd picked up lots of postcards, maps and leaflets whilst we were away, so it was relatively easy to fill the pages with lots of memories from our trip. The postcards and prints always formed the core of my pages and then I added cut-outs from the leaflets, as well as Canadian stickers when I wanted to add more to the pages. I purchased luggage labels from The Works and gel pens from both Pound World and WHSmith's, so that I'd be able to add text to the pages. White gel pens are so useful if you're filling a scrapbook that has black pages. The luggage tags, gel pen comments and captions on the Printiki prints allowed me to document information from our trip, as well as our daily itinerary. The Banff, Jasper and Waterton spreads were my favourite to create as I had so many photos to display. I took over 1000 pictures whilst we were in Canada, but the majority of them were taken in the national parks. Getting to arrange photos of those famous blue lakes reminded me of just lucky we were to visit such a naturally beautiful part of the world. Travel is a big interest of mine and I create these books so that I have a physical record of our trips. Digital photos are great, but filling a book with prints is much more personal. 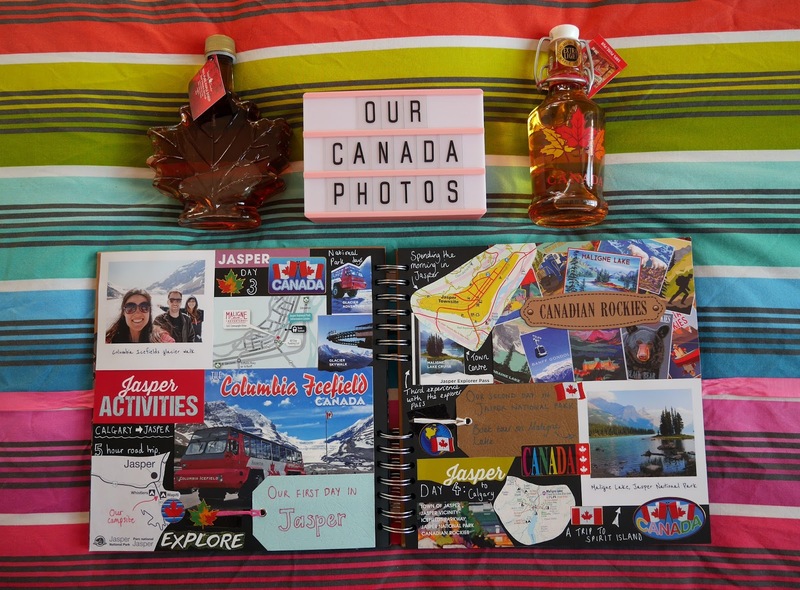 Scrapbooking is a great way to switch off, unwind and reflect on your previous travels. Presenting these pages made me realise quite how many places we visited whilst we were in Alberta. It really was a jam-packed trip! Now that I've discovered Printiki's retro prints, I'm definitely going to use them in future travel scrapbooks. Being able to add handwritten font captions to the prints makes them feel less digital and more personal. I also like the fact that they're polaroid format, which makes them much artier than standard 6 x 4 prints. 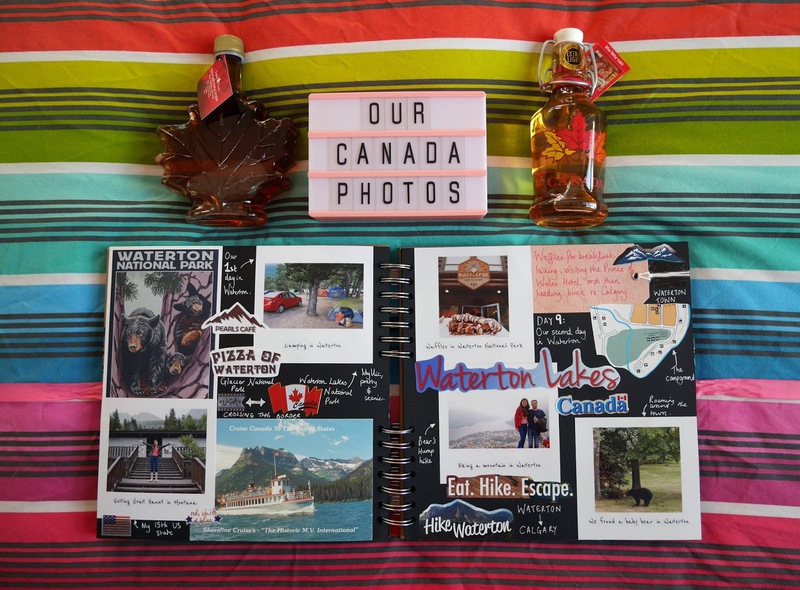 These Canada pages are definitely my favourite pages in the scrapbook so far! For DIY arts and craft project inspiration, head over to Printiki's Instagram. I like to present the prints in scrapbooks, but there's lots of other ways that you can decorate your home with retro prints. If you fancy ordering some prints from Printiki, you can get free shipping with my code: R5A6WVBV. How do you like to document your travels and adventures? *Printiki kindly sent me 30 Retro Square M prints in exchange for a review. 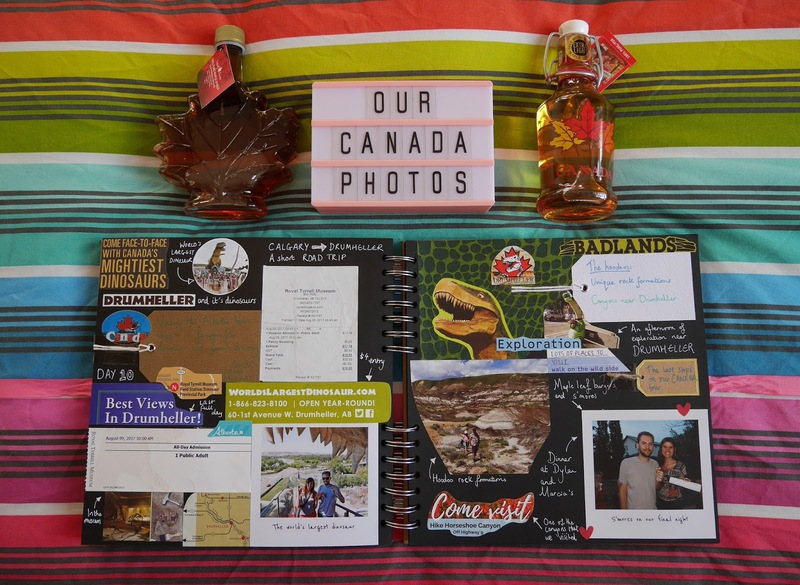 I love your scrapbook, it looks so cool - much better than my piles of standard 6x4 prints! It has become essential to recognize the need for greater flexibility acknowledging that the employees who travel on corporate trips also consider a percentage of their trip to be a leisure outlet. I needed to thank you for this phenomenal read!! Swansea weather I unquestionably adored each and every piece of it. I have you bookmarked your site to look at the new stuff you post.